Visual Arts: Value. Light and shade. Think of different light sources. Is there any difference between natural and artificial light? What happens when an object stands in front of the light? Will the shade be the same if we change the position of the light? Values are the different shades of grey between white and black. Artists use values to translate the light and shadows to create the illusion of a third dimension. A full range of values is the basic ingredient for shading. When you can draw lots of different values, you can begin to add shading, and therefore depth, to your drawings. With shading, the magical illusion of three-dimensional reality appears on your drawing paper. There are two kinds of shadows that occur when one light shines on an object, a cast shadow and a form shadow. 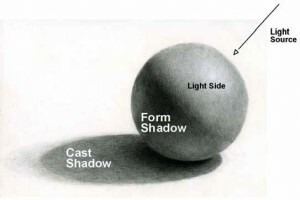 Cast shadow: When an object blocks a light source it creates a shadow. A cast shadow is not a solid shape but varies in tone and value. The farther a cast shadow is from the object the lighter and softer and less defined becomes its edges. Form shadow: A form shadow is the less defined dark side on an object not facing the light source. Form shadows are subtle shadows, but they are essential for creating the illusion of volume, mass and depth. Where are the light values? Look for the lightest areas on the object. The very brightest of the lightest values are called highlights. Where are the dark values? Dark values often reveal the sections of the object that are in shadow. By locating shadows, you can usually identify the light source. 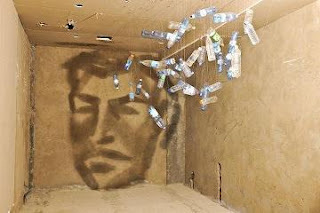 Example of the use of shadows in contemporary art. Look around you at different objects. Focus on only the light and dark areas and not the actual colours. Concentrate on the light and shadows. Then partly close your eyes until you see the values of that object. Draw an object on a black paper using chalk. In this exersice you have to look at the light. Working with light and shade.